The RosterWatch Boom/Bust Ratio is a measure of fantasy upside, while also including a component of reliability. The RB version can be found here. We are examining the last two years of data and measuring the number of 20+ point performances versus the number of performances under 7 points for each player. In other words, how Boom or how Bust these top level pass catchers really are. The metric is most useful as a relative index amongst players. The absolute value can be used to examine the surplus/deficit that each player generates. Anything under .50 is a deficit of big games or you could also say a surplus of poor games. 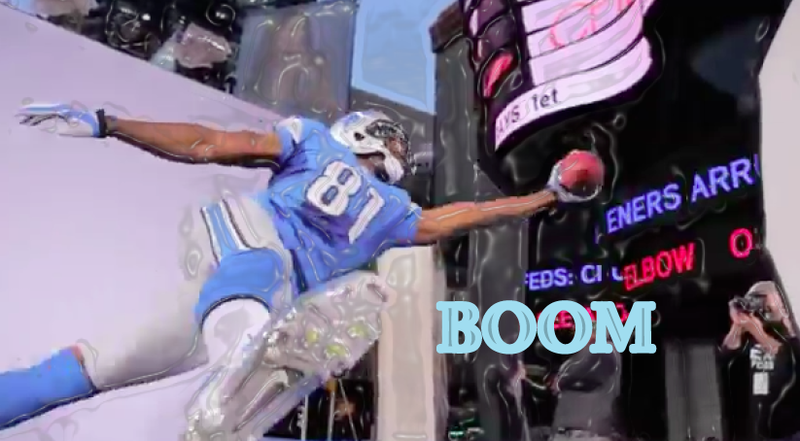 Just another number to support what you already knew about Calvin Johnson. He is the Arian Foster of WR. He is Megatron. Super reliable and super explosive. He is significantly better than anyone else and creates a big fantasy advantage every week. Hakeem Nicks‘ superior Boom/Bust Ratio, combined with his high-end reliability ratings makes him such a good player. I’d rather have Nicks than Larry Fitzgerald or Andre Johnson. Roddy White and Greg Jennings have a bit more upside than you think. Brandon Lloyd continues to impress me throughout my research. He is top 25% in reliability ratios and Boom/Bust. Now he gets Tom Brady. His current 6th round ADP is mind boggling. I love him. Mike Wallace, DeSean Jackson, and Percy Harvin are all less “Boom” than you would think. Dez Bryant has never had a 20 point game. In an otherwise fairly equal situation, this study points the needle in Miles Austin’s direction. 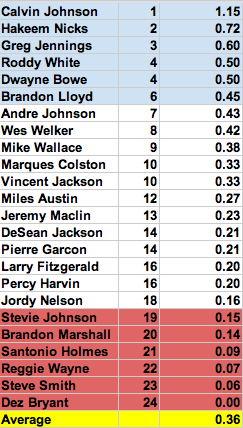 Brandon Marshall has been a bust a lot more often than a game winner. This has to change if he is to meet expectations in Chicago. I expect it will to some extent. Be realistic though. Currently, Marshall is a nice draft value.